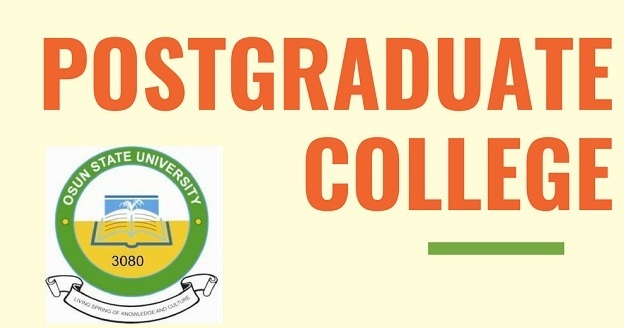 Applications are invited from eligible candidates for the the University's Postgraduate programmes including PGDE, Msc, Professional and Ph.D. All interested applicants should note as follows. Candidates seeking admission into all the programmes of the Osun State University must possess a minimum of 5 credits, including English Language and four other relevant subjects, obtained at not more than two sittings, except as otherwise required. Candidate with O'Level Examination results obtained up till 2010 must present original of their certificates for screening as their statements of results and/or result slips are unacceptable. Every candidate in regular employment must submit, with his/her application, a formal letter of release for postgraduate studies by his/her employer. In addition to the general requirements, an applicant is expected to fulfill specific requirement as regards their programme of study on this website. All application forms into the various postgraduate programmes of the University are purchased, filled, submitted and processed online via http://postgraduate.uniosun.edu.ng. All Postgraduate application forms cost N10,000.00 (Ten Thousand Naira Only), and is paid through Interswitch Payment Platform using ATM/Nigeria Debit Card. Please read the general information on (Online) e-payment System Frequently Asked Questions (FAQS). UNIOSUN disclaims any purchase that is not UNIOSUN PG Portal via InterSwitch Payment platform. No cash payment or bank to bank transfer to any account is allowed. Ready to apply?, visit UNIOSUN postgraduate application portal.